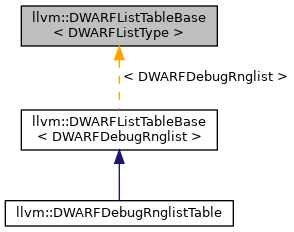 A class representing a table of lists as specified in the DWARF v5 standard for location lists and range lists. The table consists of a header followed by an array of offsets into a DWARF section, followed by zero or more list entries. The list entries are kept in a map where the keys are the lists' section offsets. Definition at line 127 of file DWARFListTable.h. Definition at line 137 of file DWARFListTable.h. Definition at line 142 of file DWARFListTable.h. Definition at line 235 of file DWARFListTable.h. Definition at line 185 of file DWARFListTable.h. Definition at line 147 of file DWARFListTable.h. Extract it and enter it into the list map if necessary. Definition at line 263 of file DWARFListTable.h. Definition at line 157 of file DWARFListTable.h. Definition at line 156 of file DWARFListTable.h. This is dependent on the table format, which is unambiguously derived from parsing the table. Definition at line 171 of file DWARFListTable.h. Definition at line 165 of file DWARFListTable.h. Definition at line 181 of file DWARFListTable.h.